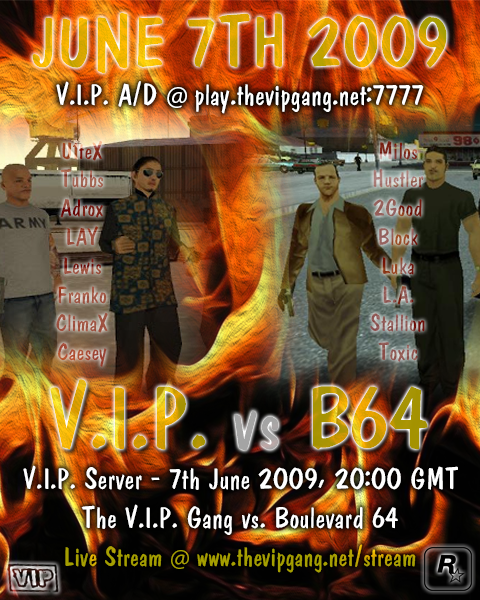 On 14th May 2006, Milos, Luka and Enginer appearing on BK SA-MP server wearing [b64] tags. Nine years have passed since that day, and yet we are still here, immune to time it seems. The most memorable thing for me was applying to become a member and going through the trial. I remember doing countless duels with B64's prominent players and then participating the training sessions. We would first go to Ventrilo and Hustler would tell me that my tactical abilities are being tested and that they are keeping an eye on me. Eventually I would pass all the tests and trials and in February '07 I joined the legendary roster. We would go on to have great success in everything we did, and I'd like to thank you guys for contributing in many different ways throughout all this time. I'd also like to thank our friends and people from other clans who have been around this community. I don't remember who was the one who came up with #RoadTo10Years hashtag, could be [uL]Jakez, but it kind of stuck in the memory and the time has come to use it. Check the news page for the article (it's actually the first one published this year) and also feel free to comment here about your most memorable moments of b64. Credit to the VIP member who designed it, whenever he is now. Congrats guys, who would have said that we'd be here 9 years ago.. Truly amazing accomplishment and we will be making it 10 very soon! Like Manowar says b64 has always been about winning. I remember back in samp just about every clan was saying that they're playing just for fun, and 2G used to say that we don't play just for fun, because we wouldn't be the best if we did, and there is no fun in losing. I remember he had a pretty big speech on Vent about it when we were about to fight [BK] and he couldn't play. And shoutout to Juggy for that great looking logo in the OP, I really like it. Like Manowar's signature says, forever the best. Good to see you guys after a while. I knew that people would be visiting the forum today. Like Manowar says b64 has always been about winning. I remember back in samp just about every clan was saying that they're playing just for fun, and 2G used to say that we don't play just for fun, because we wouldn't be the best if we did, and there is no fun in losing. I remember he had a pretty big speech on Vent about it when we were about to fight [BK]and he couldn't play. Nobody played just for fun. Maybe [___] or some clan like that, but at the end of the day, you play to be the best if you have any winning mentality inside of you. Once we enter the private TeamSpeak for a training or cw, things get serious. Even you used to go mental on the newcomers. Milos: Capture the checkpoint! Capture the checkpoint! Capture the checkpoint! Capture the checkpoint! *pause* What is so hard to comprehend? Imagine this happening in a clan war! Congrats guys, we have done an amazing job keeping the things going for so long. When I think of SAMP, I instantly recall our clan match vs xHoTx. The one we lost, that was the second match if I'm right. That one haunted me for months. Other than that, it was all cool and smooth. We've set some standards, bros.
@Manowar can't remember that for some reason, but I remember being pissed after losing our first cw. 2G brought that one on point. We seem to be indestructible. Congrats to everyone for contributing and we'll be making 10 a year from now for sure. B64 has always been the best and there is a reason for that, our roster is consisted of the most incredible and loyal guys out there. Thanks our friends for love and keep checking from time to time. Real recognize real. I remember back in SAMP that cocky clan went to my nerves by calling us out full of themselves. We brought the B team and still had an easy work. I always felt a little joy when trashing someone, but we beat them down pretty hard.